Unlike the majority of Numatic vacuums which are designed to tackle only dry floors, George Hoover is an all-in-one vacuum cleaner that is adept with both wet and dry surfaces. With a large capacity, strong suction power and extra-long hose, George is a well-built machine that can tackle almost anything you can throw at him. Read on for our in-depth George Hoover review. In terms of appearance, George is similar to the rest of the Henry family with his smiling face and bright eyes. He is green in colour and therefore is most similar to Harry the Hoover from the Henry range. George is comfortably the most powerful vacuum from Numatic’s Henry Hoover range, and with great power comes great suction. George is more powerful than the rest of the Henry family because he needs the extra power when being used in wet cleaning mode, to allow him to clean effectively. As well as a power button for switching George on, there is also a wet and dry switch, which makes it nice and easy to switch between cleaning modes. George comes with two hoses, one for dry vacuuming and one for wet. George has an excellent capacity for both wet and dry cleaning. 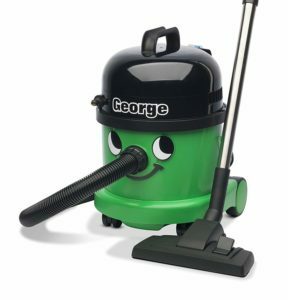 When being used for regular dry vacuuming, George has a nine litre capacity which is comparable with other Numatic vacuums from the Henry Hoover family. When being used for wet vacuuming, George has a huge 15 litre tank capacity that can comfortably tackle the dirtiest of floors. Whilst George gets high marks for capacity, it does mean that he is slightly on the heavy side. Like all Numatic vacuums George is quite bulky, which does mean he isn’t the easiest hoover to move around. That said, his wheels help to take some of the weight when moving him and the attachments are easy to attach and use, so the overall handling of George shouldn’t be a problem for the average person. es from carpets. You might find you have to work a bit harder with George on carpets, but if you persevere he’s unlikely to let you down. Of course you can also use shampoo with George to give your surfaces a proper clean, thanks to his fishtail attachment. 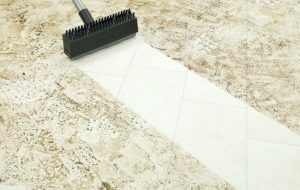 The shampoo is great at removing tough stains and long-term dirt from carpets that a dry vacuum would fail to remove. 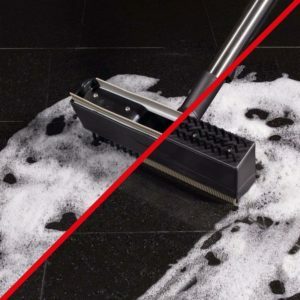 You can also use shampoo on hard surfaces thanks to the hard floor head, which has two sides that work together to produce a fantastic clean. George’s tank for wet vacuuming is easy to remove, as is slotting it back into the machine after you’ve emptied it. There is a really useful flotation ball in the pump which ensures suction is cut off if the tank becomes too full.. There is also a mesh filter which does a great job of preventing unwanted dirt from entering the tank. Like all Numatic vacuums, George is very efficient at cleaning dry surfaces. 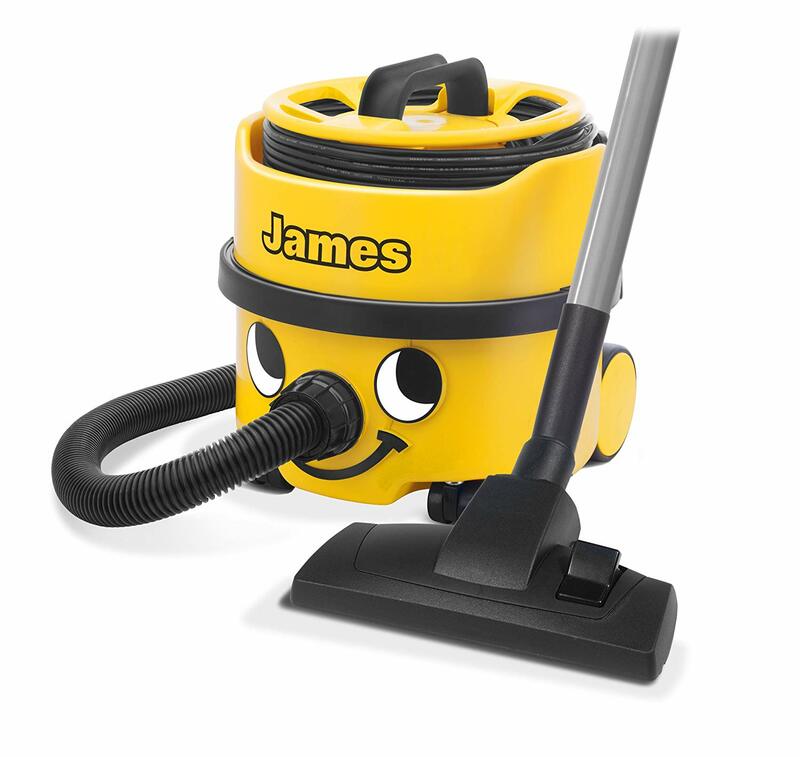 His strong suction power means picking up dirt and debris from either carpets or hard floors is not a problem. George’s hose is slightly longer than the majority of other Numatic vacuums, which means he should be able to reach the top of an average flight of stairs. As he isn’t the lightest machine to move around, being able to leave George at the bottom of the stairs whilst you clean is a helpful bonus. George comes with a nozzle that is fantastic at cleaning upholstery. 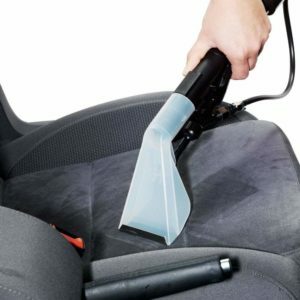 It’s a real heavy-duty grade nozzle that picks up dirt with ease from all types of upholstery. And with other accessories that come with the George, you’ve got a vacuum cleaner that can clean furniture, carpets and hard floors around your home. One area that is a real strength of George’s is car cleaning. He is the perfect car valeting vacuum. The nozzle that comes with George is not only ideal for cleaning your upholstery and stairs, but it’s also great with car mats and car seats. The well-made robust nozzle, combined with the extra-long hose, means you should be able to get all around the car without having to move George around too much. The bags themselves that come with George are the Numatic Hepa-Flo bags. You should get four bags with George and they are large and built to last, so you shouldn’t need to replace them very often. The filter with George is the standard Numatic filter, which is an excellent filter for dry vacuum cleaning. The filter is easy to access and change and fits nicely inside of George, helping to capture dust and other allergens from escaping into the air. As well as the standard Numatic attachments which come with each of their machines – such as the crevice tool and dusting brush – George comes with a range of additional accessories which help him perform his best, no matter the job. There is an all-purpose nozzle which comes with a removable brush, designed to make things easier when cleaning furniture and stairs. There is also a hose adapter for smaller and more confined surfaces. 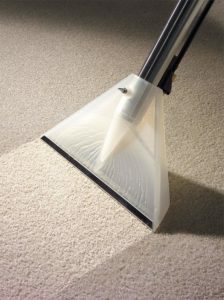 For wet vacuuming there is the fishtail extraction nozzle which is designed to be used on carpet. This tool is great for shampooing and scrubbing dirt out of carpets and does a great job at removing tough stains. The upholstery nozzle is a powerful accessory that will go to town on the interior of a car as well as furniture. As mentioned earlier, this tool would be perfect for car valeting. There is also the hard floor head which is the tool to use on hard surfaces. If you’re looking for a powerful vacuum cleaner that can be relied upon to clean both wet and dry surfaces, you’d be hard pressed to find a better solution than George the Hoover. George is a great all-in-one vacuum that is more than adequate at cleaning both dry and wet surfaces. Due to his extra-long hose and useful adapters, George is great for cleaning all types of surfaces, including carpets, hard floors, upholstery, stairs and the car. George has a huge capacity and it’s easy to switch between dry and wet modes. Due to his capacity, it has to be said that George is fairly heavy, but thanks to his wheels he takes some of the weight when you’re moving him around. The larger than normal hose means you move him less than you would a traditional vacuum cleaner. If you don’t need a wet vacuum cleaner than there are probably better options than George, but if you’re looking for a wet vacuum cleaner or all-in-one then George should be at the top of your list.